Everyone gets the winter blues. But the blues don’t have to affect your dating life. When it comes to winter date night in the Burgh it doesn’t have to be dinner and a movie every weekend. We love the winter favorites - you know like ice skating at PPG. But what about trying something new this winter? We're here to help, we’ve done the winter date research for you. It’s about to get hot. To be precise about 550 degrees. We’re talking melting glass. The Pittsburgh Glass Center hosts several Make-It-Now workshops, and around the holidays they specialize in Ornament classes. But get this. They actually have pre-planned Make-It-a-Date nights! 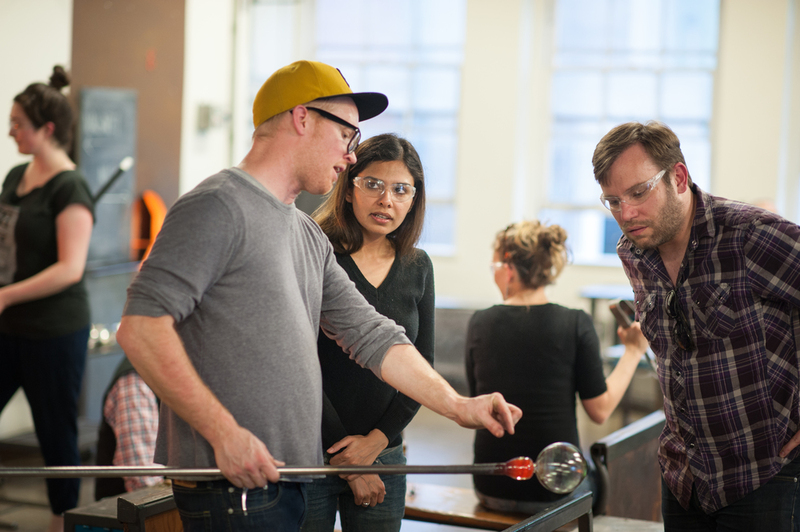 This class is definitely a test of compatibility because it takes teamwork to sculpt and blow glass. After some hands-on hot time, they provide hors d’oeuvres and wine or beer, plus live entertainment. Make a reservation to get together for a hot date at Pittsburgh Glass Center! Spend a night rock climbing for a fun new view on your relationship. The Climbing Wall, Pittsburgh’s premiere indoor rocking climbing center has more than 14,000 square feet of climbing terrain. They offer bouldering, top-roping and sport lead climbing. If you are an experienced climber then you can share your talents with a date or if it’s new to you both you can share the experience together! This date is for the beer lovers. Copper Kettle Brewing Company offers single batch one-of-a-kind beer brewing. Now this is a date you MIGHT (and I say might depending on much beer you consume) want to do as a double or even triple date. You pay per kettle brewed and the small batch will brew two cases. So why not find some other beer loving Pittsburgh couples and get to brewin'! Then you and your fellow beer lover can take your Winter Love Brew home and sip it by the fire. What’s the best Date Day? I’d say a day that involves Pittsburgh food favorites! Burgh Bits and Bites Food Tour offers a fun day of food sampling and Pittsburgh history. They offer tours in the Strip District, Brookline, Bloomfield and Northside. Check it aht! Do you know what would make holiday shopping more delightful? Enjoying the sights and sounds of the city while shopping with your Boo Bear and getting FREE COOKIES! Lawrenceville’s Cookie Tour 2015 is just around the corner. Make holiday shopping a date and a fun one while you’re at it. Visit 40 unique businesses along Butler, 39th, 43rd, and 44th Streets for holiday shopping and sample cookies! Collect the recipe cards as you go to make your own later. The event is Dec. 3, 4, 5 & 6 and you can learn more about it here. Not THOSE buns. Bread buns. Have you ever made your own bread? If you haven't you should take Enrico Biscotti's breadmaking class. The class begins around 10 a.m. with a large brunch (and who doesn't love brunch?!) and some of Enrico's homemade wine. They give a brief history of bread while you eat and drink. After that, you hop in the kitchen and learn how to make dough. Then you individually form loaves of bread and bake it in our brick oven. I see the potential for a Ghost type scene to happen here, except rather than clay this time it's with dough - are you with me?! After it's all done, you even get take your loaf home with you. The class runs about 3 hours. Wednesdays just got better. Introducing Whiskey Wednesday at Braddock's Street Side Bar. Every Wednesday from 5 p.m.-7 p.m. they offer whiskey tastings. You get to sample 3 whiskeys and learn some interesting facts about American’s original spirit. Whiskey in the winter time warms the soul. We've all been there. A night where you just don't feel like going out - especially during the winter months. Okay, I get it, BUT instead of your usual Netflix and Chill night - why not try to tackle making homemade pierogies as a date night? It’s definitely an activity for two and totally Pittsburgh themed. I feel like you would really own your Pittsburgh status if you can say you've made your own pierogies. So give it a try, at least for the bragging rights n'at. Okay you've caught me, this date isn't actually in Pittsburgh. But we had to include all the Pittsburghers that left home. Anyone can try this, no matter of location. We've tried this recipe and had success, but feel free to find your grandma's famous recipe and try that! Downtown Pittsburgh during the Holiday Season is just magical. The city seems to come alive under the holiday glow. Now picture experiencing the holiday atmosphere from a horse drawn carriage ride – much better right? It’s about to get even better because get this, November through December -- IT’S FREE. Free Carriage Rides depart the Fourth Avenue side of the PPG Place Plaza. Arrive early as rides fill up quickly. No reservations needed.